I mentioned last June that I’d bought a vintage denim jacket that proved to be in worse condition than I’d thought, so it became an excuse for my first sashiko stitching project. As Wikipedia says, this is traditionally done using white thread on blue fabric, although the truly daring use red thread for decorative effect. I thought it would be interesting to go beyond daring into eccentricity and use the stitch grid as a basis for changing colours. Of course there had to be a skull somewhere too. This is what it looked like when I showed it to you in June. I am rather pleased with this. The stitching is far from geometric perfection – the old denim has stretched and as a twill fabric it moves – but it has life. I extended the stitching onto the front left shoulder (see the photo at the end of this post) when I realised how thin that fabric was; this wear, taken with the visible wear on the seams on the left side leads me to think that someone who owned this jacket carried a shoulder bag on their left shoulder. This shows the details but the colours are dark and lifeless thanks to the dim British winter light. I didn’t plan the colour changes before I began work, just decided I’d move from a relatively pale blue on the left shoulder to purple/red on the top of the right shoulder, and picked colours on the spur of the moment to effect the changes as I stitched from left to right. I laid out a grid of stitches for the skull. Each grid square contains 6×6 fabric threads and is true to the grain of the fabric. The skull is counted cross-stitch calculated to fit on the area of the internal label, 4 stitches per grid square, worked with a single strand of embroidery floss. I don’t know whether to be flattered or annoyed that most people who see it, even local Guild members, assume it’s painted with fabric paint until they look very, very closely. I intended to leave the grid in place as background to the skull – I like organic shapes set in visible opposition to geometry – but the more I looked at it the more the ‘busy-ness’ of the grid+twill lines detracted from the skull. So I cut the threads and pulled the grid out, thread by thread. I confess I find this sadly exciting. I can paint with thread! 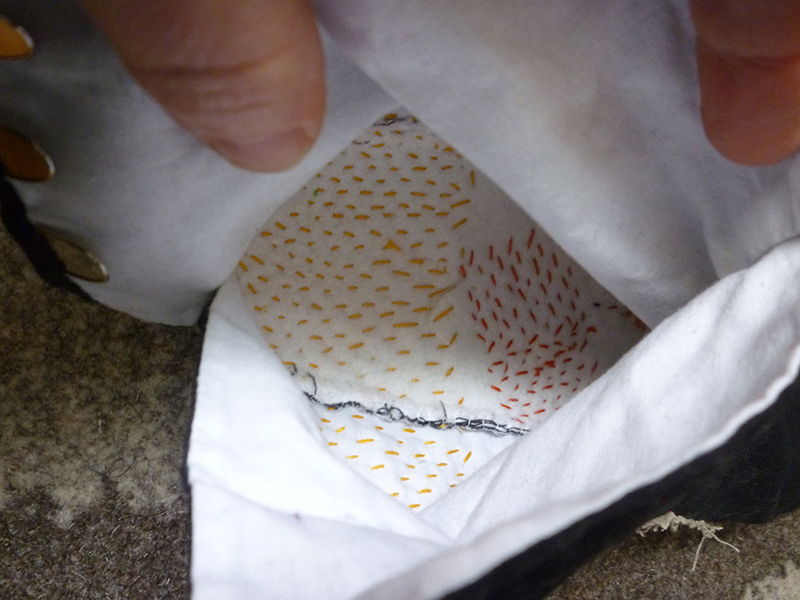 In January I attended an Opus Anglicanum workshop at Hand & Lock in London. Working from 10am until 4pm with 30 minutes for lunch I managed to cover about 2cm^2 with stitches… but what stitches! The tiny patch of underside couching at bottom left was a revelation (I can live without pearls). We started with embroidery floss to establish the technique and finished with gold. I loved it. Tiny stitches requiring precision (and magnifying glasses), exactly what I love. Then Helen McCook (the hare, look at the hare in her header! ), the tutor, mentioned Or Nue: tiny stitches requiring precision, painting with colour on gold so the density of stitches influences both colour and shine… I MUST TRY THIS. LOOK AT IT! I have acquired an Elbesee ‘sit on it’ hoop stand and hoop (that I have to wrap), I’m stitching a cotton square to mask the areas of embroidery I’m not working on. I’ve ordered gold thread for a trial design, a pack each of gold and silver thread for my first real projects. I know what I want to do but I’ve learned patience: I will start by working something very simple to test my understanding of the technique. And before that I must get some paying work done. If anyone reading this knows what type of transfer paper might have been used to copy what looks like a laser printer image onto the fabric, I’d really like to know. It’s slightly stiffer than the fabric around it, but there’s no thick layer of plastic as I’ve seen on other transfers. And of course I get to wear my jacket. First rock concert of the year is in May. I will practice using a wallet so my backpack/purse does not obscure and eventually damage it. This entry was posted in fixing things, sewing and tagged embroidery, mending, opus anglicanum, skulls on February 9, 2017 by sarahw. When work is busy, I find myself dreaming up more projects for what little leisure time remains. The less time I have, the more I want to read, make, travel, buy. I’ve begun to suspect that some of this is a form of promising myself that I WILL be able to do these things at some unspecified time in the future, when I am at leisure to devote my leisure to the things I want to do. [Mostly. I don’t want to clean the bathroom, but I’ll still have to do it or risk our early deaths from disgust, embarrassment or horrible diseases.] There was a time when I could not resist a nice handspinning fleece – and didn’t bother trying. I just promised myself that there would be a time when I had time to spend sorting, washing, drying, combing or carding, spinning and then using that fleece. Fortunately a summer spent washing and drying and starting to comb some of the hoard taught me a lesson: I already have a lifetime’s supply of wool to spin. Not to mention cotton, silk and flax. More productive and more fun than buying promises to myself is devoting some of my precious spare time to artistic mending. A couple of years ago I found an umpteenth-hand denim jacket in a flea market. It had a peculiar odour and was covered with a fine red-brown dust, but it fitted me: I bought it. 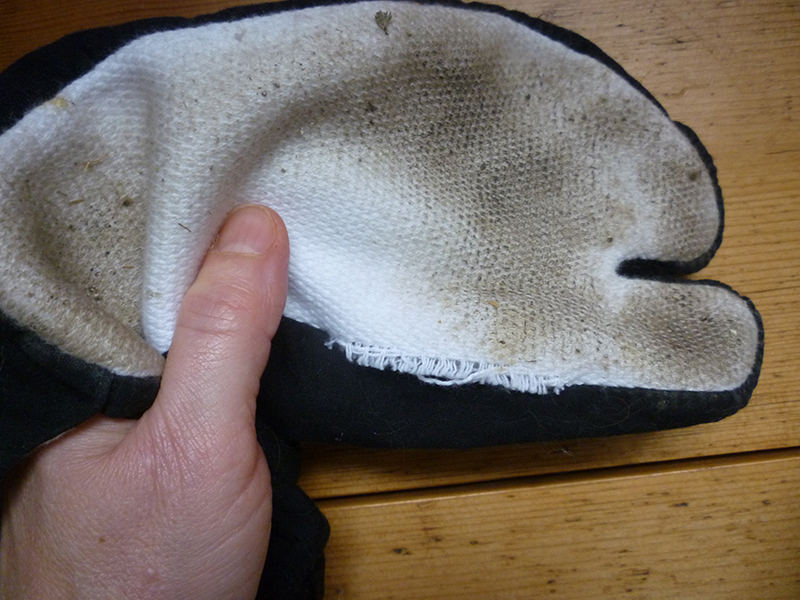 I wore it a couple of times before washing it, which was just as well because I had time to start to love it before the washing machine revealed patches of incipient disintegration. The yoke is in the worst condition, possibly due to exposure to the sun. I decided to learn sashiko [not sashimi, stupid computer] stitching by using it to attach a lining to the yoke, with embroidery thread shading from blue to red because colour can be fun. I tacked the lining to the yoke with a grid of white sewing cotton and began stitching. When I reached the first badly damaged area where only the white weft of the denim remains, I realised that sashiko alone would not be enough to take the strain, so decided to further reinforce those areas. I duplicate-stitched the twill furrows in various shades of blue; the more I did, the more my technique improved. I really like the finished effect (it’s better from a distance when you can’t see all the imperfections as below). The rectangular area marking the position of the label on the inside of the yoke posed a problem. I could try to stitch through or skim the label and continue the sashiko across it, or I could use it to define a feature, which is what I did. I designed a motif suitable for cross-stitch, picked 6 shades from my ancient hoard of embroidery thread, donned my most powerful magnifying glasses, laid out a 6×6 thread grid, and started counting and stitching. Then stopped, counted, ripped out, and counted again before stitching again. Clearly I need practice at both counting AND stitching. At this point I reserve judgement as to whether a motif was the right decision. Looking at the back of the jacket in its entirety, I think I’d have done better to continue the sashiko. But, with more work on the motif than in the photo above, it’s working and I like it. Even if variations in the thread thickness of the soft, worn denim mean that the stitching lacks precision: to paraphrase Tara, it loses precision but it gains life. 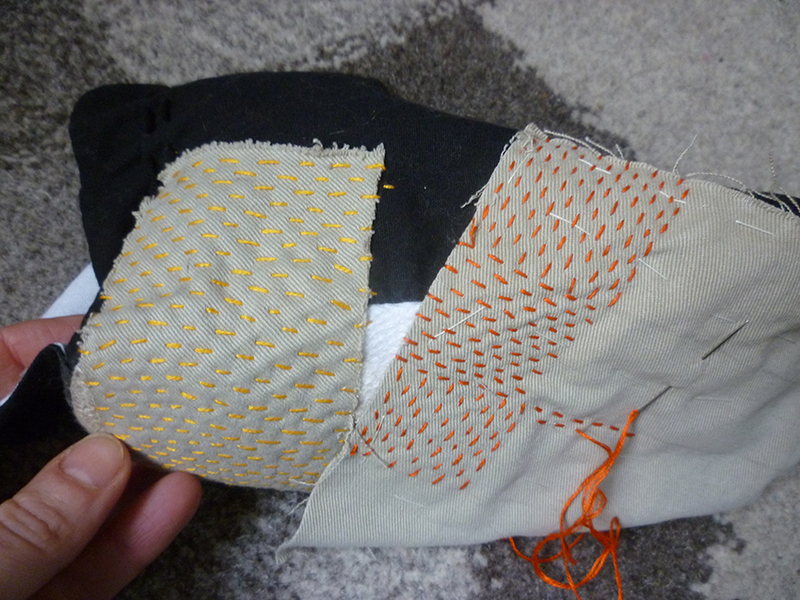 I could rip out the motif and the grid, re-do it elsewhere on the jacket, and continue the sashiko to cover the yoke. And I think I want to expand the sashiko beyond the yoke, too. After all, it’s only time. I should use the time I have to do my best. Who knows, this jacket may long outlive me. I do sometimes imagine people decades or centuries from now looking at something I made and wondering about me and my life, as I wonder about those who made the antique textiles I look at today. Speaking of which, who wants to see some antique lace? This entry was posted in fixing things, sewing and tagged mending, sashiko on May 31, 2016 by sarahw. Some time ago someone started a ‘Fridays are for Fixing’ thread in one of my Ravelry hangouts. It seemed a good idea – I have lots of fibre-ish things that need repairing – but I couldn’t bring myself to commit to the work. Last Friday evening found me sitting on the couch happily fixing something I love; I’d had a tiny lightbulb moment I’d like to share. These are my tabi. Japanese sock/slippers, with a gap between the big toe and the rest so the owner can comfortably wear zori, which resemble UK flip-flops or what I called thongs in my Canadian childhood. It’s perfectly possible to ram feet wearing ordinary socks into a pair of flip-flops, but it’s very unkind to the socks. I like tabi. They’re comfortable. 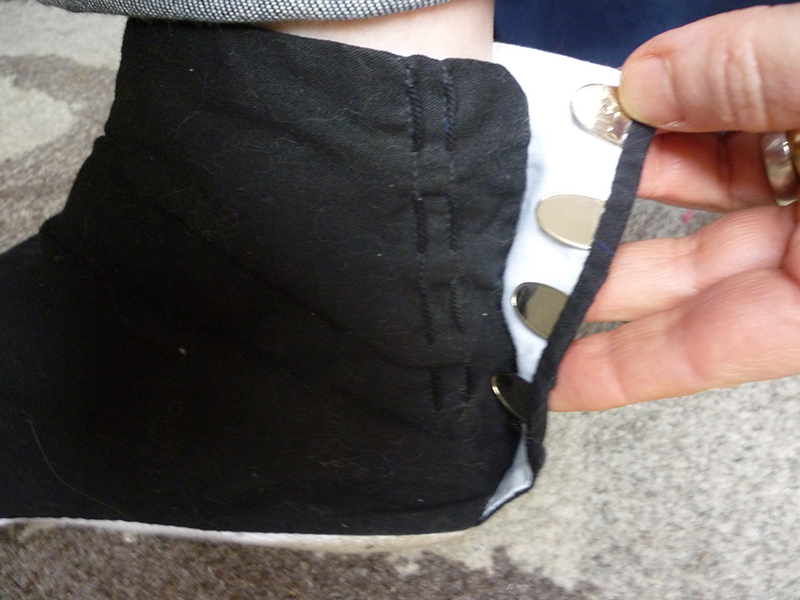 The ankle opening is closed by interesting fasteners, faster than buttons: metal tabs that neatly slide over and behind threads, like hooks and eyes, but larger and very much more … Japanese. Elegant. Sadly I haven’t been wearing my tabi because they’re broken: they weren’t very well made and the snug fit that makes them comfortable and safe to wear has pulled the material of the sole out of its seam in several places on both. They’ve been sitting in the bag of things to do for almost a year because I was intimidated by the damage. I felt it should be repaired to be ‘as good as new’, and I couldn’t think of a good way to do that; there’s simply not enough fabric to mend that seam. 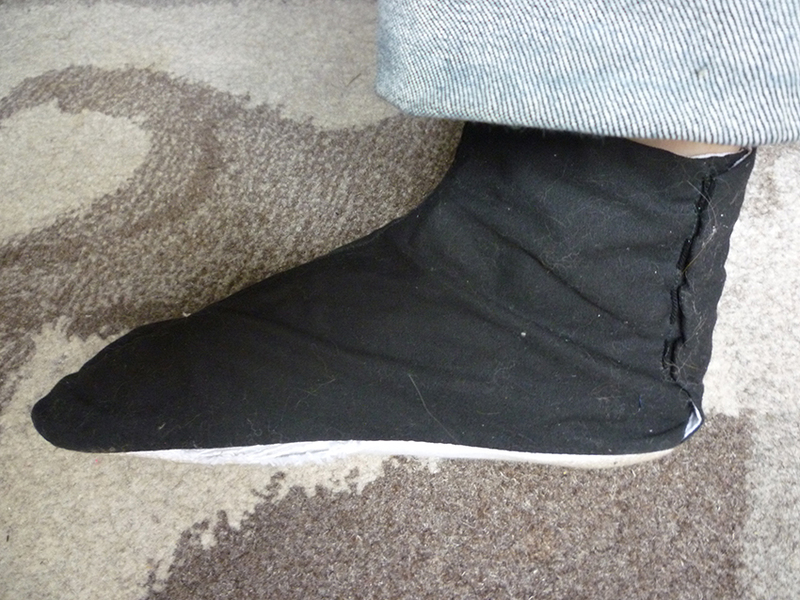 I could handstitch entirely new soles, but for the work involved I might as well buy a new pair. Or make my own, which is on my short list of projects, but I’m waiting until I have some special fabric for that. Last week the solution became instantly obvious as I cut up an old pair of my husband’s trousers for scrap fabric to test slipper patterns, stacking the pieces next to my sashiko project bag. Sashiko is the Japanese art – it IS art – of repairing, reinforcing and embellishing fabric with simple stitches. I’m fascinated by it, and by boro, the textiles (usually indigo-dyed ‘country cloths’) that have been patched and mended using these stitches. Personal revelation: I didn’t have to make my tabi as good as new. I just had to make them function as they should. I didn’t have to use indigo cotton and white thread, I could use whatever I had, which is true to the tradition of clothing repair. 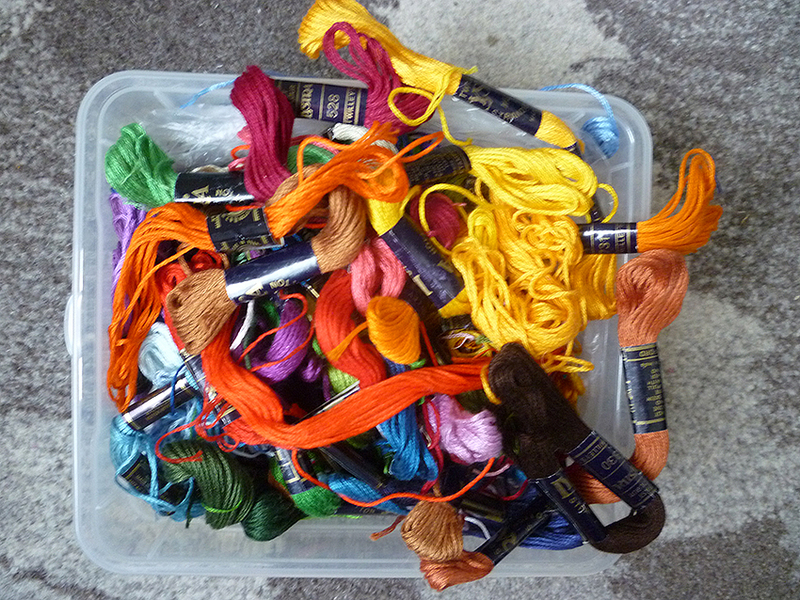 What I have is pieces of trouser leg and a box of embroidery threads, some of which are over 40 years old. I tested the patches before I started and no, I can’t feel that overlap. 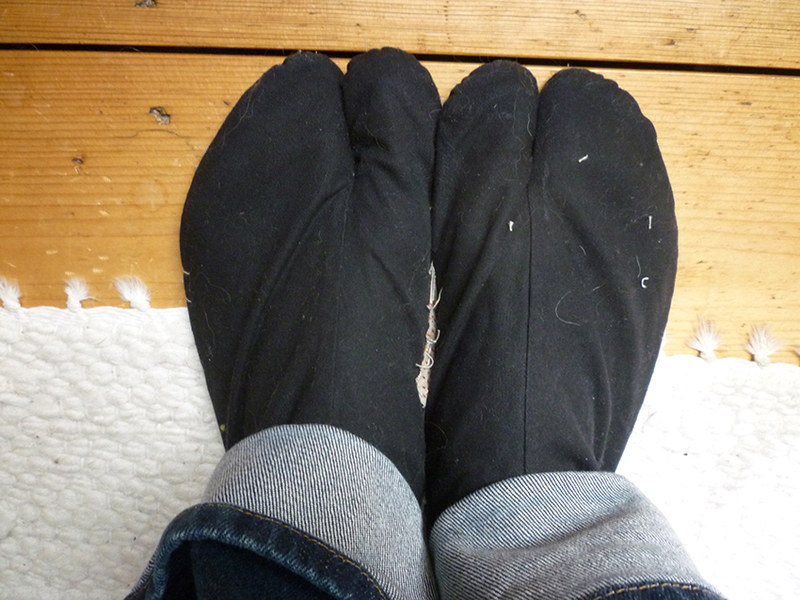 The repair might not last a long time – the embroidery thread is probably a bit too fragile – but it should last long enough for me to make my own slippers. I’m not a seamstress. I’ve done my best to avoid sewing for most of my life. But I’m beginning to enjoy it as part of the process of bringing real things into existence. I hope I’ll get better at it. I think I will. After all, practice makes perfect and I’ll get more practice now that I know perfection is not the goal. Fridays are indeed for fixing. This entry was posted in fixing things, sewing, things for feet, thinking and tagged fabric scraps, mending, sashiko, sewing, socks, tabi on December 22, 2014 by sarahw.